Mr. Usukawa, is rubber a friend of plastics? Yes. It is natural plastic and from rubber trees. I've heard of rubber trees. When a rubber tree has a damage on its trunk, white fluid called "latex" comes out. Well, it is fluid in which polymers of the rubber are scattered. We gather latex and take out polymers of rubber out of it. The polymer taken out of rubber is called crude rubber. Is there anything different between crude rubber and refined rubber? Crude rubber is a little elastic, but not as strong as refined rubber. Then, can't you make crude rubber into shaped things? No. Actually, the rubber we see in our daily life is made from heated crude rubber including sulfur. Yes. Rubber becomes strong enough to have a shape and elasticity. Even if you heat it, it won't melt but burn. I got it! It is very important to add sulfur to crude rubber in the process of refining rubber. Mr. Usukawa, you said at the beginning that plastic is also called "synthetic resin", but what is resin? Resin is a substance that is liquid or semi-solid. If you pour resin into a mold and harden it in some way, you can create some products or confine something important to it. Well, it's hard for me to understand. Oh, is it? Then, you know pine trees, don't you? Yes, I do! Cone trees, right? When you give damage to the trunk of a pine tree, liquid comes out with a penetrating smell. The liquid is called "pine resin." Really? Does pine resin have anything to do with resin? Yes, indeed. If pine resin is left untouched, it'll get solid and become transparent yellowish plastic. Wow! Does the liquid coming out of a tree become plastic!? Amazing! It's another kind of plastic, isn't it? That's true. Liquid that comes from trees and get solid in the air is called resin. But now, liquid which gets solid if given a certain stimuli is generally called resin. Furthermore, there are two kinds of resin.One is "thermoplastic resin." It gets cold and solidifies, after adding heat and transforming.Another is the "hardening resin" in which form is fixed, when fabricated. The greater part of a plastic is not plastic? Sae, Mr.Tic, you may not believe it or not, but the greater part of a plastic isn't plastic. Oh! Mr. Usukawa, what do you mean? Do you know plastics aren't always made out of only plastic? That's right. As Sae just said, plastics are produced by adding plastic to some chemical substances. There’re three things: colorant, light stabilization agent, and plasticizer. Let me tell you about colorant first. Mr.Tic, what color do you think plastic is? Right. Plastic is generally colorless, and the plastic including an ingredient of crystal is white. But most plastics have various nice colors. Yes. Quite a few colors are used for bags for wrapping foods. This is because plastic is mixed with colorants, such as dyestuff and pigments. Really? Plastics aren't colored after produced, aren't they? No. Plastic is a group of oil, so if you use dyestuff in plastic which is easy to melt into oil, it can be colored evenly. That's the reason plastic is colorful. That's right. If you use suitable pigments, you can give plastic not only colors but also optical properties, such as light reflection. I understand colorants don't only give colors to plastic. Next, I'll explain a light stabilization agent. If plastic absorbs ultraviolet rays, it will be decomposed and less strong. And its color will change into yellow. I've seen a plastic discolored into yellow before. 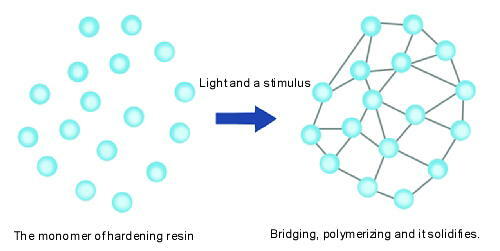 Well, additive called light stabilization agent is used for plastics, especially outdoors so that it won't decompose in an ultraviolet ray. Can we protect plastics from the ultraviolet ray using the light stabilization agent? Yes, the light stabilization agent absorbs the ultraviolet ray very much and changes it into heat. I see. The light stabilization agent is such a nice substance to plastic! Lastly, I'll talks about plasticizer. Yes. Plasticizer. "塑(so)" means to transform shapes, and the plasticizer is a substance which can make hard plastic flexible enough to change its shape. There are some kinds of plastic from hard to soft. But if the additive called plasticizer is used in hard plastic, you can change it into soft plastic. It's great! Could you take an example? For instance, polyvinyl chloride is very hard plastic. You can adjust the hardness as you like by adding plasticizer. Wow. What kind of thing can be made from polyvinyl chloride? Water pipes and the fabric supported sheets used for sofas are made from polyvinyl chloride. Fantastic! The uses of these two things are different, but they are made from the completely same plastics. That's true. Water pipes are made of polyvinyl chloride which contains little plasticizer, while fabric supported sheets are made of polyvinyl chloride containing much plasticizer. The additive like plasticizer has an great influence. Mr. Usukawa, foaming polystyrene and urethane foam belong to the plastic, don't they? How are they made? Good question! A thing containing a lot of foams in its structure, like foaming polystyrene and urethane foam is called "foam-formation object." I see. Foaming polystyrene is a wonderful substance because it seems like a mass of tiny round grains. Yes. Foaming polystyrene is made of polymers called polystyrene. Yes. One of the properties of polystyrene is to absorb oil very easily. Foaming polystyrene is made using this property. The property to absorb oil very easily? I'd like to learn more about it. OK. Let's say, you infiltrate volatile oil to grains before molding polystyrene. If you mold this liquid, it gives heat. The heat boils the oil and makes foams, and they remain. 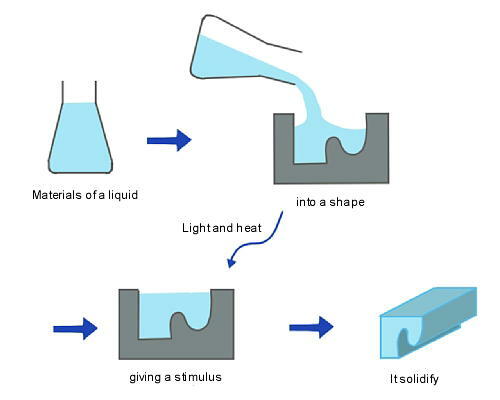 This is how foaming polystyrene is made. I see. We can take advantage of the property of polystyrene. Everybody would guess so. You would find it difficult to make foams from liquid which is as smooth as water, because the foams will soon disappear. But if the liquid contains the polymer, which is the large molecule, you can make sticky mass of foams. I understand. That's why polystyrene foams will not disappear. Yes. If we use different kinds of oil in making foams, we can make various kinds of foaming polystyrene. Wonderful! I had no idea foaming polystyrene is made by using oil!